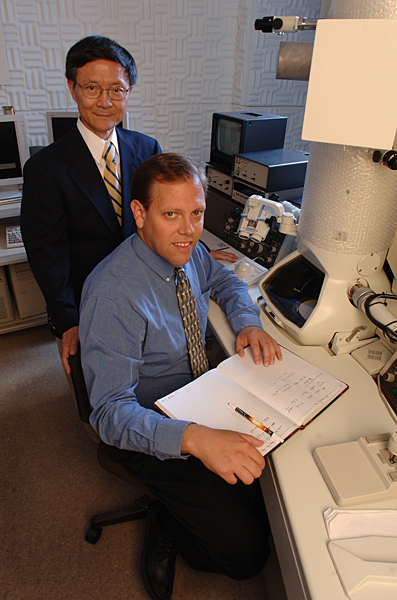 4:37 p.m., Oct. 4, 2006--Two University of Delaware researchers have discovered a means to detect and identify damage within advanced composite materials by using a network of tiny carbon nanotubes, which act in much the same manner as human nerves. 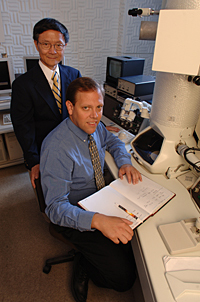 The discovery has important implications both in the laboratory, where the scientists hope to better predict the life span of various composite materials, and in everyday applications, where it could become an important tool in monitoring the health of composite materials used in the construction of a variety of essential products, including commercial airliners. The research is the work of Tsu-Wei Chou, Pierre S. du Pont Chair of Engineering, and Erik Thostenson, assistant professor of mechanical engineering, and is featured in an article published in the influential journal Advanced Materials. 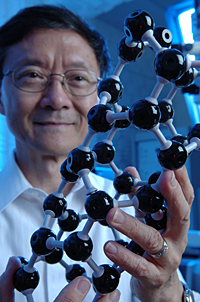 Chou said the research team has been working in the field of fiber composites in conjunction with UD's Center for Composite Materials and of late has taken an interest in the reinforcement of composites with minute nanomaterials--a nanometer is a bare one billionth of one meter--and particularly with carbon nanotubes. Besides being very strong and very light, the carbon nanotubes have an incredible ability to conduct heat and electricity. In the latter case, they are 1,000 times more effective at carrying an electrical current when compared to copper. “Carbon nanotubes have excellent properties and the challenge has been how best to utilize them, to translate those properties into applications,” Chou said. Given the various properties, Chou and Thostenson set out to develop the carbon nanotubes as sensors embedded within composite materials. This results in “weak spots in composites in the interface areas in the matrix materials, particularly where there are pockets of resin,” Chou said. As a result, defects, including tiny microcracks, can occur. Over time, those microcracks can threaten the integrity of the composite. Thostenson said the carbon nanotubes can be used to detect defects at onset by embedding them uniformly throughout the composite material as a network capable of monitoring the health of the composite structures. “Nanotubes are so small they can penetrate the areas in between the bundles of fiber and also between the layers of the composite, in the matrix rich areas,” Thostenson said. Because the carbon nanotubes conduct electricity, they create a nanoscale network of sensors that work “much like the nerves in a human body,” he said. The researchers can pass an electrical current through the network and “if there is a microcrack, it breaks the pathway of the sensors and we can measure the response,” Thostenson said. He added that the carbon nanotubes are minimally invasive and just 0.15 percent of the total composite volume. At present, composite material engineers have limited means to either detect the initial onset of microcracks or identify the specific type of defect. This finding will change that because the method is simple, does not require expensive equipment and is remarkably sensitive to the initial stages of microcracking, Thostenson said. The work provides a new tool for research in the laboratory at present and has many potential applications in the future. By identifying and tracking defects in a laboratory setting, the researchers can now begin to develop strategies for more accurate predictions of the lifespan of composite materials. That is very important given the growing applications of composite materials in everyday life. Composites are used in sporting goods, civil infrastructure including bridges and pipes, and transportation, particularly in the aircraft industry. The research is supported by funding from the Air Force Office of Scientific Research and the National Science Foundation. Chou, who last year was named a fellow of the American Institute of Aeronautics and Astronautics, joined the UD faculty in 1969, after receiving a doctorate in materials science from Stanford University. 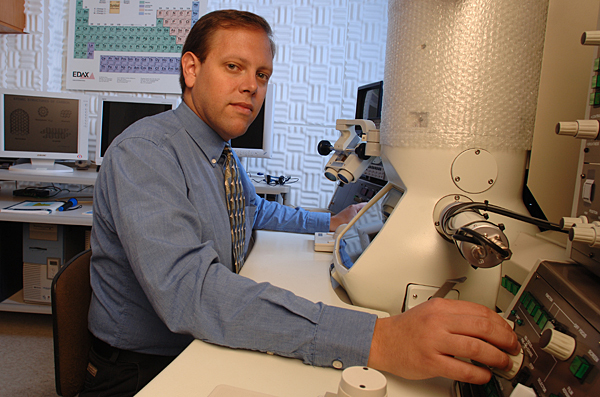 Thostenson joined the University faculty in 2005 after earning his doctorate in materials science and engineering the previous year. He also received a master's degree in mechanical engineering from UD and a bachelor's degree in composite materials engineering from Winona (Minn.) State University.